Which starlet do you think looked more stylish Ashley Tisdale orKendall Jenner! This one is a tough! Kylie Jenner and Emma Roberts both looked pretty adorable in this green Amanda Uprichard dress. Love how they both paired it with a bold heel! Which girl do you think wore it best? Kourtney Kardashian and Melissa Rauch both wore this black dress by Ted Baker on the runway recently. Do you prefer Kourtney’s neutral accessories, or Melissa’s bright ones? Charlie’s Angel Annie Ilonzeh and AnnaLynne McCord both wore this trendy Baby Phat maxi out to enjoy the warm summer weather. Do you prefer AnnaLynne’s chunky necklace or Annie’s white fedora with the dress? Love this fun asymmetrical dress from Blaque Label! Ariana Grande paired it with wild leopard print heels, while Kourtney Kardashian went for a more subtle snake-skin print. Which celeb do you think pulled off this effortlessly glam look better? Between Catherine Zeta-Jones and Sarah Hyland who gave the lace dress a glamour look? 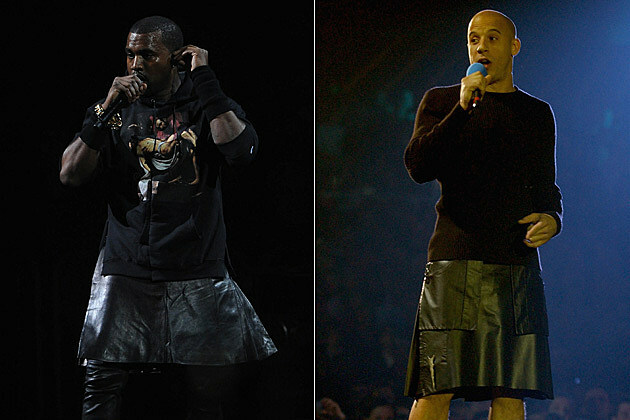 Kanye West‘s leather kilt was probably the most talked-about element outside of the music.The two men gave the look a different style but the skirt fit better on one of these young ladies men.who rocked it better Kanye West or Vin Diesel? Christina Aguilera and Angelina Jolie look tres chic in this black, lacy Michael Kors gown! The ‘Your Body’ singer and the ‘Changeling’ actress both wore this dress in 2012 to red carpet events, but which famous woman wore it best in your opinion? 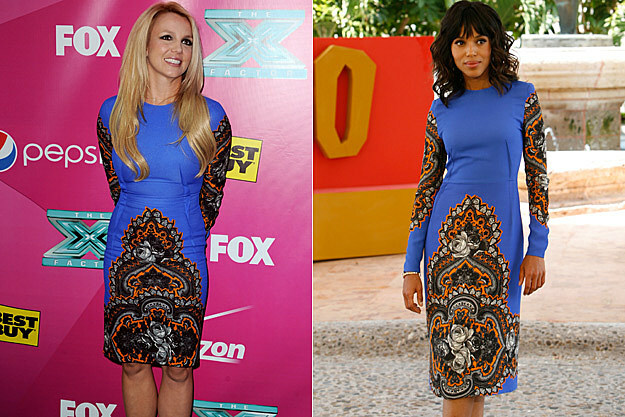 Stella McCartney dress worn by singer Britney Spears and actress Kerry Washington is certainly an eye-catching piece, but which of these famous gorgeous girls wore it best? « America lives under the shadow of George W. Bush.Can this be true?